So why is the media reporting tiny measles outbreaks as if the sky itself is about to fall? Doesn’t it seem as if everywhere you turn, another outbreak is reported with dire warnings that the unvaccinated are about to bring us an epidemic, the likes of which we’ve never seen? Kind of reminds you of the media frenzy over the Disneyland outbreak in 2014–2015, doesn’t it? That’s when Big Pharma focused their efforts on California and pushed through SB277, a law which removed religious and personal belief exemptions from the mandatory vaccine schedule in order for a child to attend daycare or school - public or private. Perhaps they figured that if they could manage to remove parental health choice in California, it would be a domino effect in the rest of the country. What’s the big deal, you might ask? 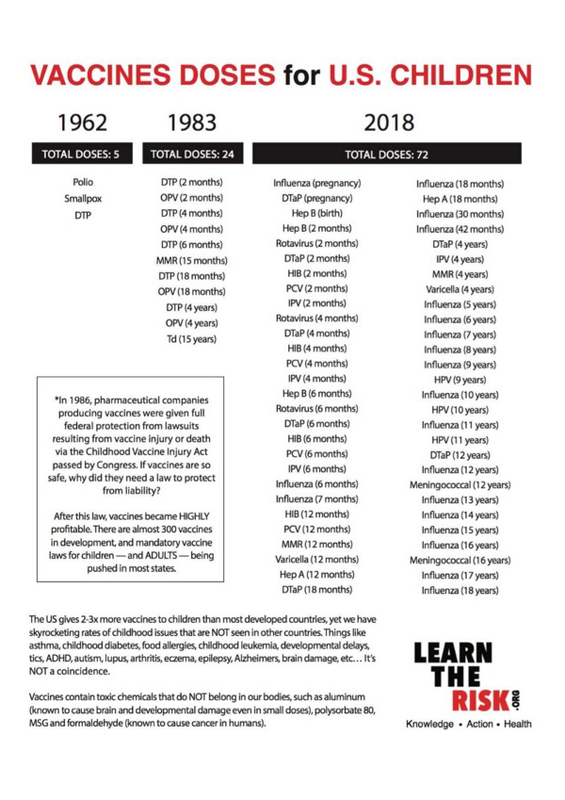 Well, the CDC vaccine schedule has become quite a doozy since vaccine manufacturers were released of all liability for injuries or death with the National Childhood Vaccine Injury Act in 1986.⁵ Check out the current CDC schedule. 72 doses of vaccines by the time a child turns 18. Not quite the vaccine program of our youth. Children today are given more than 20x the doses of vaccines than my parents got. And it seems Pharma is pushing from all sides to make sure no one can avoid shooting their kids up with an insane number of doses of various cocktails of aluminum, formaldehyde, human DNA, polysorbate 80, and viruses and bacteria grown on diseased tissue. Misinformation abounds all over mainstream media where Big Pharma owns 70% of the advertising and therefore the narrative.⁶ Take a look at this opinion piece in Newsweek, which by the way, uses a doctored stock image of a healthy baby to look as if it has what the photoshop artist thinks is measles.⁷ It looks more like hives, but whatever. These days, accuracy is not the paramount concern for any major news outlet doing Pharma’s bidding. This is designed to misinform the public about parents’ concerns about vaccines and to present vaccines as no different than natural pathogens your child may be exposed to in his or her environment. This could not be further from the truth. Vaccines are injected into the body – bypassing the normal routes of entry our immune systems are designed for – and the vaccines contain such combinations of substances and toxins like aluminum adjuvants, formaldehyde, human DNA, mercury, Polysorbate 80, and the live or attenuated bacteria or viruses which have been grown on animal organs. This Newsweek piece accuses parents of spreading a “malicious lie” and “purposeful misinformation.” Ascribing malice to concerned and well-researched parents is not only absurd, but deliberately inflammatory and is clearly intended to villainize parents who thoughtfully and understandably question or don’t participate in the conventional vaccine program. This attempt at marginalizing and diminishing perfectly reasonable concerns expressed by doctors, scientists and parents, as well as vilifying anyone who questions the wisdom of the current vaccine program is not only unwarranted and unjustified, it is also remarkably stupid and unscientific. The only people profiting from such an approach are those making money from a market projected to be worth $50.42 billion by 2023. The idea that we know everything there is to know about the immune system and the consequences of an ever increasing vaccine schedule is one few would actually agree with. Let’s bear this in mind as we move forward on this issue, and let’s learn how to spot the propaganda when we see it. Only then will true scientific method prevail. 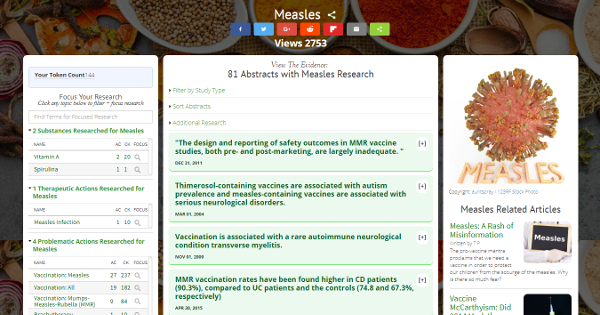 For additional information for natural, evidence-based interventions for measles, visit the GreenMedInfo database on the subject. 11. “Dissolving Illusions: Disease, Vaccines, and the Forgotten History.” Suzanne Humphries, MD and Roman Bystrianyk. 2013. 22. “Miller’s Review of Critical Vaccine Studies: 400 Important Scientific Papers Summarized for Parents and Researchers.” Neil Z. Miller. 2016.
speaking of big pharma ….